Festival season is the perfect opportunity to experiment, especially with your hair and makeup. That said, not everyone has a beauty squad with them to help them get Coachella ready. You all already packing tons of amazing festival looks so I’m going to make your life a little easier, and your carry-on a little lighter. Here are two beautiful and simple festival inspired looks that you can quickly recreate on your own. The best part? All you need to pack is a case of bobby pins. You know that quote about taking one thing off before you leave the house? Well, ignore that for this look. Pile on a row of decorative bobby pins to create a look that’s one part retro and one part bubble gum pop star. Start with loose textured waves created with a barrel curling iron or softly braid your hair the night before for low maintenence texture. Next, add a side part and pile on the pins. 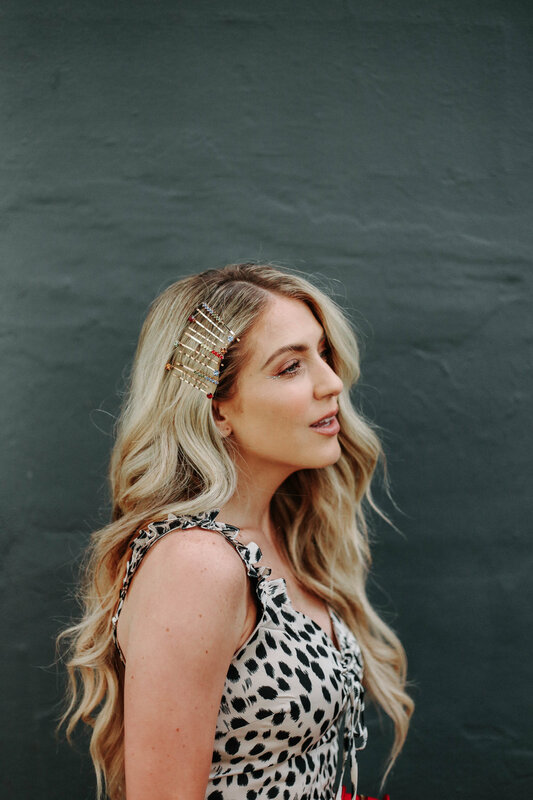 Expert tip: Be sure to flip the bobby pins, randomly in both directly to create an effortlessly cool vibe. All this look requires is a friend (or a hand mirror) to help you see the back of your head. Just slide a few colorful bobby pins into waved and teased hair to create a beautiful geometric design along your crown.